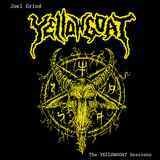 Staying on the primitivism trajectory, while grabbing from the same Hells Headbangers pile, the next in line (after Satanic Threat) was Joel Grind’s solo Yellowgoat project, his only full-length to date titled The Yellowgoat Sessions. Known to metal loving mankind from his Toxic Holocaust semi-one man project, with his purely solo effort Joel Grind does not deviate far from his early Toxic Holocaust days. Going for lyrical topics more to do with Satanism and occult, rather than nuclear fallout and war, the music is very slightly blackened diffuse sounding punky thrash. Produced and mixed in just a couple of days, even if the intent was to smooth out the sound, that might not have been possible. By nature then, and by design, the dirty straight simple riffs can be catchy as hell on some of these cuts (Hell’s Master of Hell, Grave Encounters, Hail to Cruelty). Guitars come in several layers, the overall choppy foundation, in between picked tremolos, and once in a while Joel breaks out a gnarly solo to reinforce his one-two riffs (Hell’s Master of Hell). Vocals, just as rough as guitars, serve the purpose, but that can’t be said about the rhythm section. The bass is not heard, and drums are as complex as what I heard in my daughter’s seven grade band concert recently. Standard, repeating, definitely supporting role beats, with an occasional fill, hint at drum machine. That device used or not, even if it was, the rhythmic potential was not realized on these Sessions, so guitar riffs are what the songs live and die by. Foul Spirit Within and The Eternal One deviate from the rest of this brew. They slow the tempo down, invoke stomping hellish doom, and sound more Bathory and early Black Sabbath, than Motorhead, which is an obvious reference elsewhere. Even though those songs must be important to the overall album’s message, I was more taken up by the simplistic catchy numbers I listed above. Not all of the songs on the Session get to that level, but those that do, you won’t notice the time fly by, and your neck and tapping feet are guaranteed a good cardio exercise.